Famous Buildings that Introduced the "Modern Movement" in India! Do your building needs to be new to become modern? Absolutely No! Few most modern buildings are in fact centuries old. Modernization came to India during the late 19th century and continues till today. Modern is not a synonym for contemporary here. It is a term, which defines the time when the entire human race across the globe experienced a significant change in their way of living and thoughts called the ” Modern Movement”. In India (in Asia) as well as in most of the developing countries, modern is considered as a synonym of “western” which is due to colonial mindset. Actually in our view modern is something which is thought, perceived and practiced ahead of its time! The Modernization was a revolution of new ideas and thoughts. It was changing the way people live, In the way they work, the way they produce goods and the way they build. The effect was also on the artistic aspects of life. Music, Painting, Sculpture, Architecture and many other art forms went through experimentation and were becoming in their own way modern. Must Read: Modern Architecture: Know its Importance & Characteristics! Modern Age in Architecture started in the late 19th century with the start of Industrial Revolution. New technology exposed the architects and engineers to new construction techniques and materials, which led to a change in the architectural ideas also! The advent of “Modernism” or “Modern Movement” in Indian started when few most influential modern architects like Le Corbusier & Louis Kahn came to work In India. Also, many Indian architects, went to study and work in foreign countries and brought with them a very new language of architecture that was “Modernism”. Charles Correa, B.V. Doshi, Anant Raje and other modern architects of the 20th century gave a very big contribution to the modern movement in India. This exchange of ideas between the Indian and the foreign architects, lead to the development of few most iconic architecture (buildings) in India. This famous building, which looks like the upcoming project of Dubai is actually an Indian Baha’i temple, designed by Fariborz Sahba in the year 1986. The concept as is the name of the building is Lotus! Besides the fact that it was a modern famous building, its design was rooted in the Indian language of symbolism. The Lotus flower is very sacred in Indian Culture and is the symbol of Purity. In addition, a lot of importance was given to the number 9, which signifies “The Nine Graha” in Indian Astrology. The lotus temple has 9 Doors, 9 Bridges and 9 Ponds surrounding it. The Building envelop is in form of 27 marble petals which envelop the circular space inside. With its grandeur and beauty, this bold structure continues to be one of the most famous modern temples in India. Apart from its architectural language, it is a structural engineering marvel too! The Indian Institute of Management, Ahmedabad was built way back in 20th century. The world-famous architect Louis Kahn designed the building on request of Ar. B.V.Doshi, a Modern Architect from India. It is one of the best modern architecture example in india. IIM Ahmedabad was built to create a new school of thought for modernizing the way of learning in India. Therefore, it was very important that its iconic architecture should also complement its intention of modernization! Louis Kahn did a tremendous job and designed this exposed brick structure giving it a modern geometrical language. This building influenced many other Indian Architects and helped to take the modern architecture movement forward. If you feel that this building is a Le Corbusier’s design for the west than you are partially correct. Yes, it is a “Le Corbusier’s Design” but this is not in the west but in India itself. The best example of “Modern Movement”. 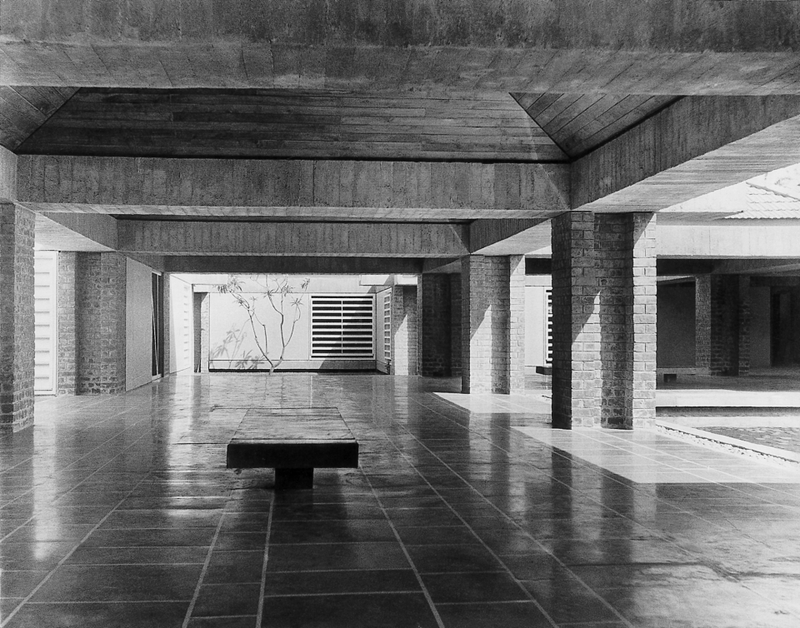 “The Secretariat” is the small part of the big contribution made by Le Corbusier in designing the modern city of Chandigarh. This exposed concrete building is 254m.long and 42 m. high. The small square windows, the external ramps, and the exposed concrete texture make it look like a sculpture. It is one of the most dominant structures in the Capitol Complex of Chandigarh. Architect Charles Correa designed the British Council of India, building in the year 1992. This red sandstone building, devoid of any ornamentation is still appealing to eyes because of its simplicity! Charles Correa has given a lot of importance to symbolism in his design. This can be experienced in the planning of the building. The most interesting feature of this building, the facade mural is also symbolic of the Shadows of Banyan Tree. The architect has designed it in a modern style but has maintained the Indian Essence. The use of courtyards, fountains, murals, use of stone and symbolism, imparts this modern building an Indian flavour. Modern Architecture in India cannot be summed up by just explaining a few famous buildings. Every designer developed his or her own language of Modernism. But every language originated from the same roots. Simplicity, Form Follows Function, Open Floor Plans, Exposed Concrete Structures became the key concepts behind every design. Also Read: What is the Brief History of Concrete? In a nutshell, Modernism was not only an architectural modern movement but also a cultural one! The change in the architectural designs was a result of the change in the perspective of people, the change in the way they were looking at architecture. And so for me, it is the most important “modern movement” in the field of Architecture!